Beulah passed away on April 22, 2011. She was born October 21, 1931 in Provo, Utah, to Charles Henry and Erma Hansen. She spent her early years in Springville, Utah. While in high school, Beulah met and fell in love with Ronald Backus. They married in the Salt Lake Temple in 1948. Beulah and Ron moved to Mesa, Arizona in 1954. She was a member of the Church of Jesus Christ of Latter-day Saints and served faithfully in many capacities. Her greatest joy in life was her family. 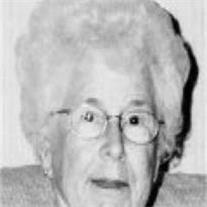 Beulah is survived by her husband, Ronald, her sister Jeanne Rasmussen, her 5 children, James Backus, Lynda Williamson, DeeAnn Ford, John Backus, and Joseph Backus. She also leaves thirty grandchildren and fifty-nine great-grandchildren. Services will be held on April 29, 2011. Viewing will be held at 9:30 with Service to follow at 11:00 at the Mesa Kimball East Stake Center located at 4640 E. Holmes. Interment will be at the cemetery in Pagosa Springs, Colorado. Funeral arrangement made through Bunker Funeral Home.